You've chosen your subject, transferred the image to your drawing surface, are ready to start your project. . . And you now have a painting surface looming in front of you! Where do you start? Though there are no "rules" for how to begin a painting, many artists have developed "getting started" strategies that make it easier for them to focus their energy and jump into the creative process. 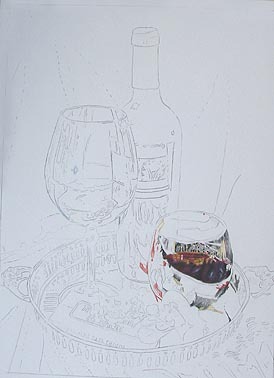 One great way to begin a drawing or painting is to start with the very darkest areas first. By isolating the dark areas you are, essentially, doing a "value study" of your composition. This is important for several reasons. Beginning artists often do not have enough value contrast (i.e. deep dark colors and bright light colors) in their work, leading to bland, lackluster paintings. Being aware of correct values and having enough value contrast helps creates depth, interest, and drama. Getting the darkest colors down first can help you better judge the correct values in other areas of the painting. Also, getting your dark values down first (AND GETTING THEM DARK ENOUGH!) can help you avoid having to go back in and rework areas later in the painting process that were not dark enough to start with. 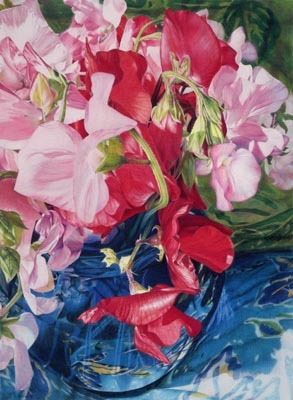 The colored pencil painting above, Mom's Sweet Peas, is a fairly complex, detailed composition. 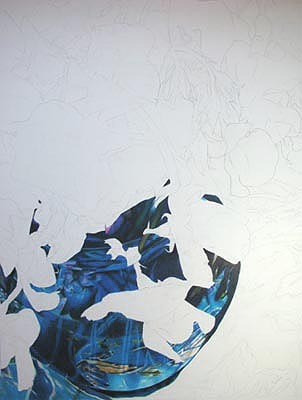 Starting a piece with this much detail could be overwhelming without a clear-cut plan. Sandy began this piece by putting in the darkest values first, in this case the very dark blues in the vase holding the flowers. Not only did this strategy help her to more easily gauge the values of the flowers and the rest of the background, it also helped to define the shapes of the flowers in the foreground, which are the focal point of the painting. Sandy proceeded with the blue and green background next, followed by the flowers towards the back. She painted the the foreground flowers last. Saving the focal point for last is often a good strategy because, by that time, you have had ample practice with the painting's colors and values, making errors to this important area less likely. Sandy employed a similar stratedy in the still life below. 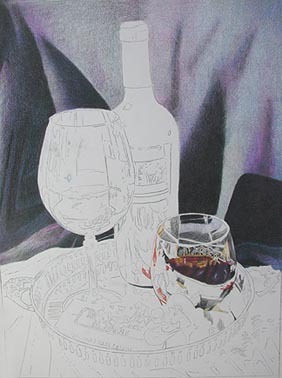 The darkest values in the painting were found in the deep red inside the wine glass and in the very dark shadows of the fabric background, so she began her painting by getting those values down first. She continued this painting by further developing and darkening the fabric before returning to paint the remaining objects in the foreground. A bridge can be helpful when working with graphite or colored pencil, especially when working on large drawings. A bridge is an elevated rest for your hand that keeps your hand and arm from rubbing against your artwork and smearing or pulling pigment around. A bridge can easily be made using a small wood piece with a padded "foot" under each end. 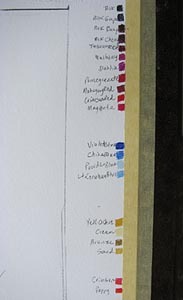 It is a great idea to make a small test swatch of each color that you use in your painting, either in the painting's margin or on a "test strip". Label each color and keep the test strip handy as you work. These swatches help you judge how the colors will look next to each other before you use them and you can use your test strip to practice blending and layering colors before mixing them on your painting. This color record is also extremely helpful should you need to return to your painting after an extended period of time--It can be very difficult to remember what colors you used weeks or months ago! 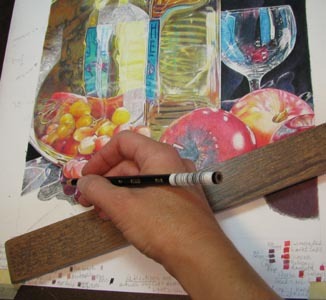 When working with graphite or colored pencil, have a soft drafting brush handy and gently dust off your painting surface periodically. This helps to keep light colors and unpainted areas clean and bright.